Note: You may order any offer online from this catalog/guide just by printing out the page and sending payment to the dealer above. YOUR NAME and ADRESS Can go on these pages Instead of ours for the INTERNET version. This offer is available world wide. However, payment must be made in US Dollars. Please ad $5 US to cover extra postage outside the USA. Email us if you need further details or for our prices if you need hosting services for the Internet Version or if you have questions. Please put "Questions about InfoPak101" in the subject of your email. **Note: All product covers and box displays are for virtual display purposes only. Although No hard-copy versions are available most all the eBooks have a print option that will allow you to print out your own Hard-Copy. 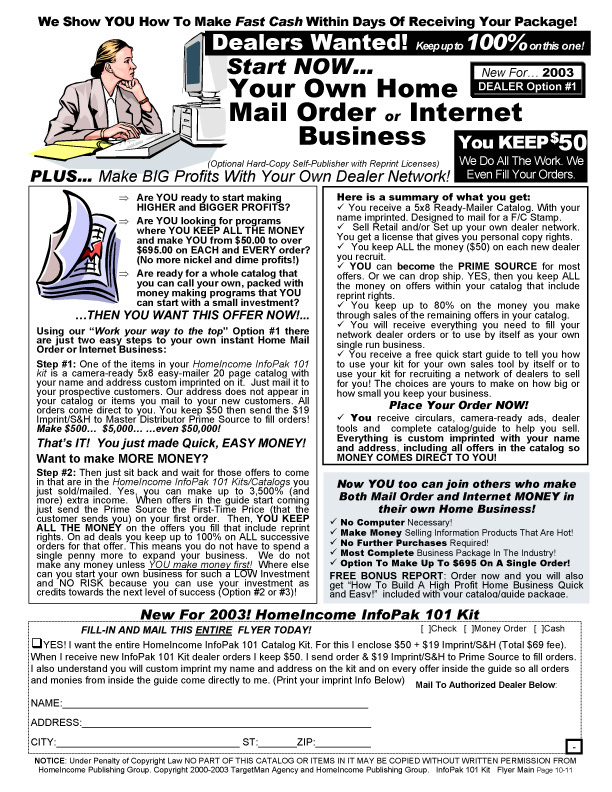 Many dealers do this and charge a Hard-Copy fee to their customers (giving extra profits). Products and CD requires Windows 95/98/2000/XP or Greater. Copyright © TargetMan Web Graphics & Designs, Inc.